This tractor is of standard manufacture, primarily designed for heavy agricultural and light earth moving duties. It is used as a general purpose tractor, bulldozing and towing etc. on production bogs where its higher bearing pressure is accepted. 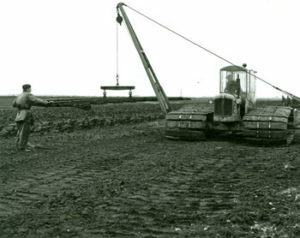 The tractor incorporates the same power/transmission unit as used in the Bord na Móna, Type Tractor, the half shafts driving the track sprockets directly. The track frames are constructed in fabricated steel and are fitted with track rollers mounted on a dead spindle with frictionless bearings and patented pressure seals. The track chain is made up of cast steel side links, pins and bushes on which is bolted steel (grouser plates) sleepers. The driving sprockets are cast steel, toothed with solid cast centre while the idler sprockets are spoked cast steel with plain rim. The track frames are fixed to the transmission half-shaft housings at the rear while they support the engine unit on a spring beam between the two tracks at the front. This tractor was designed to meet the many needs, on development and production bogs, for a general purpose tractor, which could not be satisfied by any tractor of standard manufacture. It is used for towing spreader and sod collector sections at machine turnings, assisting machines in sinking conditions, ploughing virgin bog, and is fitted with attachments for bulldozing, angledozing, rail lifting and laying, screw drain cleaning and V dozer windrowing, etc. The machine has a sturdy main frame built up for standard steel channel and angle section mounted on tracks of generous proportions. The power unit and transmission gearbox are that of a standard agricultural tractor, fitted with a proprietary clutch and brake steering arrangement and a special reducing final chain drive from the half shaft or the standard transmission to the track driving sprocket. The machine is fitted with a hydraulic pump, front and rear, with the control valves for each system conveniently placed within the driver’s cab.